It’s 1814. Napoleon has escaped his imprisonment on Elba. Britain is at war on four fronts. And at Stranje House, a School for Unusual Girls, five young ladies are secretly being trained for a world of spies, diplomacy, and war…. Napoleon’s invasion of England is underway and someone at Stranje House is sneaking information to his spies. Lady Jane Moore is determined to find out who it is. If anyone can discover the traitor, it is Jane—for, according to headmistress Emma Stranje, Lady Jane is a mastermind. Jane doesn’t consider herself a mastermind. It’s just that she tends to grasp the facts of a situation quickly, and by so doing, she’s able to devise and implement a sensible course of action. Is Jane enough of a mastermind to save the brash young American inventor Alexander Sinclair, her friends at Stranje House, and possibly England itself? Fans of genre-blending, romance, and action will love this Regency-era alternate history novel filled with spunky heroines, handsome young lords, and dastardly villains—the third in the Stranje House series. Don’t miss the first two books: A School for Unusual Girls and Exile for Dreamers. 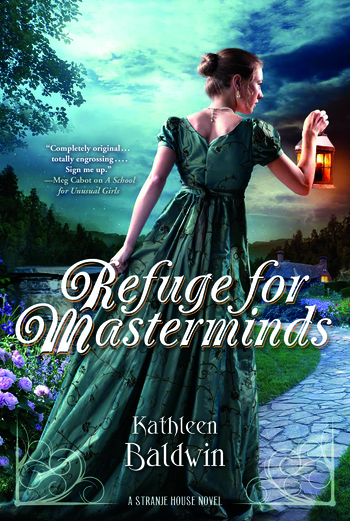 KATHLEEN BALDWIN has written several award-winning traditional Regency romances for adults, including Lady Fiasco, winner of Cataromance's Best Traditional Regency, and Mistaken Kiss, a Holt Medallion Finalist. The Stranje House series, including A School for Unusual Girls, Exile for Dreamers, Refuge for Masterminds, is her first series for teens. She lives in Texas with her family.